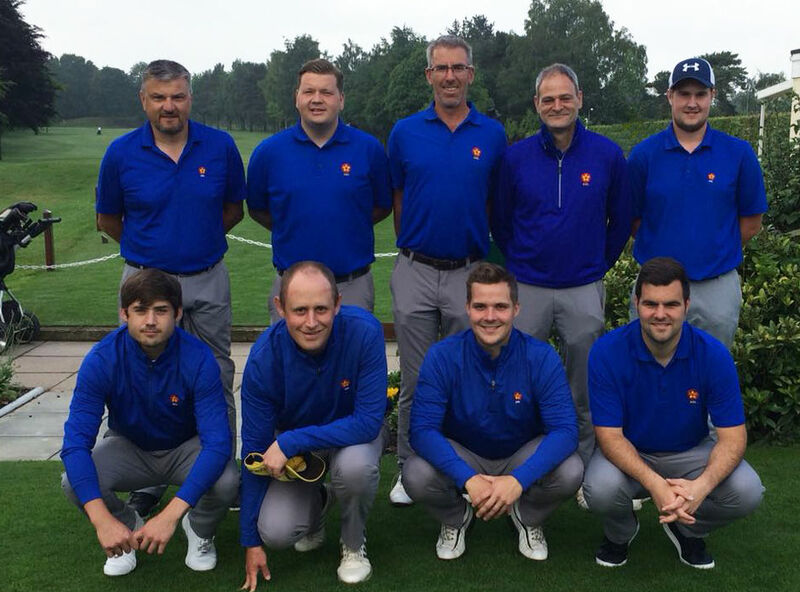 After the most monumental downpour during the practice round on the Saturday we arrived at Eaton Golf Club in Norwich on a lovely sunny summer’s day to play against Norfolk. The course was completely flooded at 6pm but by 9am the next day it was immaculate. Ian Wicks and Jordan Darnell played Jack Hazel and Richard Wilson and again got off to a spectacular start with an eagle at the first. This was a new pairing and seemed to work well from the off. Once again every score report put them 1up or all square, until the 13th where a costly 3 putt put Northants behind for the first time. It seemed a real turning point, not just in the match but the whole session. Having looked good for the majority of the round, again it somehow ended in a 2&1 loss. Is anyone starting to see the pattern here? James Barker and Richard Dalton played game 4 against home member Dylan Green and Aiden Tanner and made the standard Northants birdie on the first. I think as a foursomes team we played the first in 5 under so preparations were obviously ok. After the standard birdie, the Northants duo lost a few holes in quick succession and found themselves 3 down after 7, but if you learn anything from these two it is that they never give up. They kept going and chipped away at the lead and started to put Norfolk under some real pressure. As the last game on the course I got to see quite a bit of this near the end and saw Norfolk missing lots of fairways and greens, but not dropping any shots. They hit the green on 17 and converted the putt so somehow despite playing very similar golf the Northants pair went down 2&1. Has this actually just happened? Weren’t we doing ok in all the matches? Disaster, total disaster, 4-0 down at lunch, and for the 2nd match in a row there was a mountain to climb. If not Everest, it was certainly the Eiger. For the 2nd match in a row it seemed like a shake-up at lunch time was needed. Having done a bit of re-jigging at half time, it looked like every player had a fresh opponent so nobody had seen any of them in action in the morning. The perfect fresh start we were after if we were going to overturn such a gargantuan lead. Taylor Sargeant played Richard Wilson going out first. Taylor volunteered for this position and assured me he was going to deliver the point so out he went. After 3 holes Taylor was 3 down and the disaster was looking well on the cards, but give Taylor his dues, he was so up for this game and by the time he’d got round to 8 he was all square again. Getting regular updates on the rest of the progress in the matches behind seemed to inspire Taylor and he looked impressive when finishing birdie, birdie, birdie to win 2&1. First point on the board at about 4pm… a little later than would have been nice. Ian Wicks played home member Dylan Green and probably had the exact reversal of the type of match he’d had in the morning. He was always 2 or 3 down at all the various check points around Eaton until he suddenly won 3 in a row and was all square going up 16. Dylan birdied 17 for the 2nd time that day to take a 1up lead down the last. What followed next can only be fairly described as a shambles, with both players hitting provisional drives and a duff each. Fortunately for Northamptonshire, our double bogey 7 was better than Norfolk’s triple bogey 8 and the match was halved. It’s not how, it’s how many, although 5 would have been much less stressful to watch at that stage of the game. Jamie Powell who was returning to the Anglian league after a 6 year absence looked impressive throughout playing Aiden Tanner. Jamie was driving it very long and very straight, which is the perfect combination round Eaton. He was always 1 or 2up at the various points of the course and arrived on the 16th tee 2up. He duly dispatched his drive 330 yards down the middle some 50 or 60 yards ahead of his opponent. I was just about to turn away as this was a done deal, until Aiden hit driver out of the semi rough to 6 feet and duly converted for eagle. Jamie looked impressed and un-impressed in equal measures. Jamie was a lot better than his opponent and the last hole is also a par 5, so when his opponent tried to make up for being 50 yards behind again his approach shot ended up in the car park. Jamie made birdie to win 2up. A very impressive return and good to have you back J.
Tom Burgh played Kevin Webb in the afternoon and put on a clinic of hitting fairways and greens. He was in total control of the match the entire way round the course and outclassed his opponent on his way to a 5&4 win. Just what the doctor ordered and it was at this stage we started to get a little excited as we were ½ a point short of getting back on level terms. James Barker went out number 5 and played against Shaun Larkins. Two more opposite golfers you couldn’t hope to pair together. On his day Shaun can be scintillating, but perhaps the afternoon was not his day. James is a relentless match player and just doesn’t make mistakes. After 7 holes it was only a question of how many he would win by rather than if he would win. James was as many as 5up after 12 but rather coasted home and after a quick word from the captain James said “I’ll stop messing about and beat him here I promise.” Promise kept, 3&2 win for James and the Scores were tied. Jack Brown was put in his favoured number 8 position against Norfolk youngster Jack Cullington looking to make probably the best comeback ever in my 10 years in county golf. Jack thrives on pressure more so than anyone I know but just looked a tiny bit crooked in places and got behind early. I watched Jack make 2 or 3 really lovely birdies, but also saw his opponent do the same. Jack won 15 and 16 to make a fight of it, but not for the first time on the day Norfolk holed a good 6 foot putt to half the hole and win the match overall. Heart break for Northamptonshire, I’m sure nothing but pure relief for Norfolk. I again want to commend the team for the effort that they put in and the character they showed in the singles. When we can transfer that mentality to the foursomes we will be a very different proposition.